Milwaukee is the most German of major American cities, and Germans have constituted Milwaukee’s largest immigrant group. The city’s brewing industry, tradition of ethnic festivals, built environment, and history of working-class politics all display the influence of the German immigrants who arrived in especially large numbers during the half-century following 1850. As the number of newcomers began to decline in the early twentieth century, almost half of city of Milwaukee residents reported that they, or their parents, had been born in Germany. Despite the differences among them, German immigrants participated in a common German-language debate over public issues and shared the benefits of being designated white. Although they spoke different dialects, they valued the German language, passing it on to their children and sometimes grandchildren. The immigrants argued over what it meant to be German, but they agreed that celebrating their German ancestry was entirely compatible with their loyalty to the United States. They were powerful advocates of the idea that cultural diversity did not interfere with political unity, an idea known as ethnic pluralism. Attacks on German culture during World War I accelerated its decline in Milwaukee, but German Americans themselves quickly rebounded, and so did ethnic pluralism. To a large extent, timing accounts for the number of German immigrants who came to Milwaukee. Southeastern Wisconsin first opened to white settlement during the 1830s and 1840s, a period of economic disruption in Central Europe. Crop failures, agricultural consolidation, and industrial competition created hardships for Germans who relied on traditional farming and handwork. For families with some resources, crossing the Atlantic Ocean was one option. The appeal of migration only increased after 1848. That year, German radicals and reformers called for the German lands to unite under democratic control. When the Revolutions of 1848 failed, some participants—known as “Forty-Eighters”—fled to escape retaliation, but far more Germans moved because they lost hope that things would improve at home. Religious restrictions and prejudice exacerbated the hardships that some people experienced, but it is difficult to separate religion from other reasons that Germans migrated to Milwaukee. By the late 1830s, German immigrants were arriving in the frontier town “in droves.” The size of Milwaukee’s German community quickly became its own attraction. One immigrant explained that his family chose Milwaukee in the 1840s because Germans could “get along” there in their native language. Germans were so influential, he wrote, that some Americans took the trouble to learn German. The early immigrants concentrated in neighborhoods northwest of today’s City Hall, but many of them intended to stay in the city only temporarily before purchasing a farm. Of those who realized their dream, significant numbers settled in nearby counties that would eventually become part of metropolitan Milwaukee. In 1870, the German-born populations of Waukesha, Washington, and Ozaukee counties sat at 16, 28, and 34 percent, respectively, while the city of Milwaukee sat at about 32 percent. In contrast to most immigrant groups, German Americans were not overwhelmingly urban. Milwaukee’s German community was integrated into the most German state and the most German region in the country. As a hub, it was connected to, but different from, smaller German settlements. The work that immigrants performed depended on location, gender, and background. On mid-nineteenth-century farms, German-American women were more likely than their Anglo-American counterparts to work in the fields. In urban areas, women tended to labor within their homes, with a minority keeping boarders and plenty of girls and young women performing domestic service for other families. In Milwaukee itself, German-born men were more likely to work in unskilled positions than native-born men. Yet more German Americans were employed in skilled trades such as carpentry and tailoring than in any other occupational category as early as 1850. Compared to the Irish and later immigrant groups, they more often arrived with tools and training. Unskilled and skilled immigrant workers set an early precedent of organizing along ethnic lines to make class-based demands. German-American laborers rioted when the La Crosse and Milwaukee Railroad failed to pay them in 1853, and unionized tailors, shoemakers, cabinetmakers, and printers staged a flurry of strikes in the early 1850s. Before the Civil War, some German-born craftworkers and retailers owned small businesses, but a relatively low percentage of immigrant men controlled substantial companies or worked as professionals. The wealthiest immigrants had often accumulated capital and experience in Europe before exploiting auspicious personal connections in Milwaukee. The Best brewing family, for example, relocated its operations from the Rhineland to Milwaukee in 1844. During the 1860s, the city’s two largest breweries belonged to Valentin Blatz, a German-trained brewmaster, and Joseph Schlitz, the son of a wine merchant. Both Blatz and Schlitz married the widows of brewers. German immigrants prospered in other industries too. Guido Pfister and Frederick Vogel owned the largest of Milwaukee’s numerous tanning companies in the late nineteenth century. Religious differences among German Americans were as obvious as economic ones. Roman Catholics made up about a third of the immigrants, and they established the firmest institutional base. In 1846, St. Mary’s became the first of many German-speaking parishes, which anchored an array of voluntary organizations, schools, and publications. German-American Catholicism was particularly influential in the lives of immigrants in rural Washington and Ozaukee counties. Appropriately enough, the first four archbishops of the most German archdiocese in the United States spoke German, and its seminary specialized in training bilingual priests. Members of Protestant and Jewish congregations appointed clergymen and determined affiliations to larger religious bodies themselves, so they developed more fluid institutional structures. The Wisconsin Evangelical Lutheran Synod formed in Milwaukee in 1850, but many Lutheran parishes affiliated with less conservative bodies. By the 1860s, immigrants were worshipping in German at a variety of different Protestant churches with their own emerging charitable, educational, and publishing networks. Only a few percent of the German families in Milwaukee were Jewish. Some Jews worshipped informally and organized burials before 1850, but the first congregation dates to that year. Within two decades, German Jews could attend one of several different synagogues. Many also joined secular German organizations. German-American trade unions, choral and folk culture societies, sharpshooting clubs, aid societies, and fraternal orders formed in Milwaukee in the 1840s, and elite cultural institutions and radical political groups proliferated the following decade. Among them, the Milwaukee Musical Society quickly included other Americans, the German and English Academy offered private bilingual education, and the Turnverein combined gymnastics, German culture, and, in the case of Milwaukee’s largest chapter, left-wing politics. As important as such groups were, they included few observant Catholics and Lutherans. For all the divisions among German immigrants, they agreed on their superiority over other Americans when it came to fostering meaningful human interactions and warm sociability. As the Milwaukee-born son of a German woman wrote, “The Yankees [Anglo-Americans] were regarded as a class of bloodless and soulless individuals who worshiped the almighty dollar, constantly sought to practice paternalism over the newcomer, and lacked an appreciation for the higher and nobler impulses of life.” To introduce other Americans to German culture and meet their own emotional needs, German Americans opened beer gardens and held festivals. The Volksfest of 1852 was a prime example of religious and secular organizations coming together to parade, enjoy German music and sports demonstrations, and, importantly, drink. Immigrants considered alcohol consumption integral to their way of life, and defending the right to drink often became a political rallying cry. The Democratic Party of the 1840s was sensitive to the cultural priorities of white immigrants, so German Americans supported it with few exceptions. The most important Democratic leader in the early German community, physician Franz Hübschmann, championed the cause of voting rights for white immigrant men who were not citizens, believing that they should be able to vote as long as they had lived in the state for a year and had begun the naturalization process. Hübschmann supported Moritz Schöffler, who was founding editor (1844-1847) of the German-language Wisconsin Banner and represented immigrants at the convention that wrote “alien suffrage” into Wisconsin’s constitution in 1848, well before black citizens could vote. Mathilde Franziska Anneke, a Forty-Eighter from Prussian Westphalia, agitated for women to receive the right to vote too. In 1852, she began publishing the first feminist newspaper in the United States. The Deutsche Frauen-Zeitung appeared in Milwaukee, and it appeared in German. During the 1850s, Forty-Eighters around the Midwest led many German immigrants into the anti-slavery Republican Party, but their success in Milwaukee was limited. During the 1850s, Mathilde Anneke wrote abolitionist fiction, Bernhard Domschcke published a series of Republican newspapers, and Carl Schurz spent several winters in Milwaukee practicing the political skills that would eventually take him to the U.S. Senate representing Missouri. Another Forty-Eighter and Republican, Eduard Salomon, resided in Milwaukee only briefly before being elected lieutenant governor in 1861. He served as governor when his predecessor accidentally drowned in 1862. But these leaders were out of step with the majority of German Americans in southeastern Wisconsin. The Republican Party in the state attracted few immigrants because it did a poor job of distancing itself from the anti-immigrant activism of the 1850s. When the Civil War came, German immigrants were less enthusiastic about the Union cause in Milwaukee than in other Midwestern cities. There were men who eagerly joined the Union army with the goal of preserving the Union and ending slavery. Domschcke, Schurz, and some members of the Turnverein would fit this description. At the other extreme, Catholic immigrants from Luxembourg and German states violently protested the draft in Ozaukee and Washington counties. Milwaukee’s Democratic Seebote newspaper encouraged and defended the protestors. The city’s largest German-language daily at the time, the Democratic Banner und Volksfreund, supported the fight to restore the Union, but printed speeches and editorials condemning “contemptuous agitation about the slavery question.” Of course, commitment to the Union was enough to convince many German Americans to enlist. These men and other German Americans were always suspicious that Anglo-Americans did not fully appreciate their sacrifice. The temporary reduction in German immigration during the Civil War and the economic depression of the 1870s coincided with a watershed in European history: the Franco-Prussian War of 1870-1871. 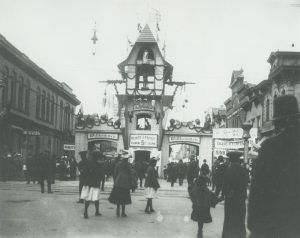 To celebrate Prussia’s defeat of France and the creation of the German Empire in 1871, German Americans held “one of the largest celebrations ever held in Milwaukee.” The impressive parade was just one sign that the formative phase of German immigration to Milwaukee concluded not with immigrants adopting Anglo-American habits, but with the establishment of a diverse and assertive community. German migration to the United States peaked during the 1880s. The new arrivals were less likely than their predecessors to have owned land in Germany, and some were victims of Otto von Bismarck’s anti-Catholic and anti-socialist laws. Milwaukee’s growing industries offered unskilled workers wages higher than they could command in in Europe, but work could be dangerous and inconsistent. There were advantages to joining a well-regarded community, but some individuals found migration emotionally wrenching. As a group, German Americans were distinguished from Irish immigrants and the growing number of Poles, Italians, and others by their wealth and power. Germans too met opposition from Anglo-Americans who opposed social drinking and were suspicious of radicals and Catholics, but they fought back. They managed to overturn Wisconsin’s Graham Law, which tightly regulated alcohol sales from 1873 to 1874, and the Bennett Law, which from 1889 to 1891required that private schools as well as public ones use English as the main language of instruction. Identifiably German institutions thrived during the late 1800s. In 1890, Port Washington and West Bend had weekly German-language newspapers, and Milwaukee had five different dailies. George Brumder published one, the Germania, around which he built the largest German-language publishing house in the country. 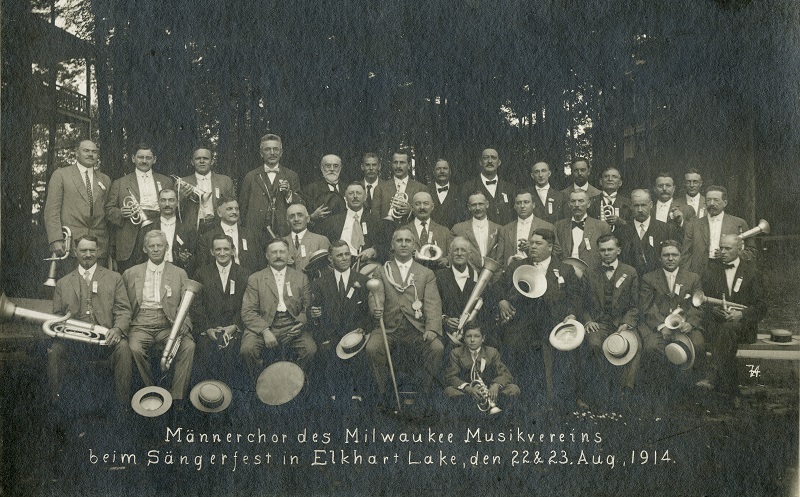 National festivals such as the 1886 Sängerfest enthralled Milwaukee audiences, and immigrants regularly attended German-language concerts and plays, some of which were written locally. German-language entertainment venues dotted the city, the most famous being the Pabst Theater (built in 1895). Other structures from this period also endure as a testament to the achievements of German immigrants. The prolific architect Henry C. Koch designed buildings such as the Turner Hall on Fourth Street (1883), the Pfister Hotel (1893), and City Hall (1895) that gestured to the land he had left as a toddler. Women’s organizing became an increasingly important feature of German Milwaukee during the period after 1870. Many all-female groups accepted conservative gender roles, but some socialists, Turners, and “freethinking” opponents of traditional religion called for women’s rights. Mathilde Anneke was active in the national movement for women’s suffrage, representing Wisconsin at the founding of the National Woman Suffrage Association in 1869. From 1865 until 1883, she also ran the Töchter-Institut, a small private girls’ school known for rigorous and holistic bilingual education. German immigrants arriving after 1870 were responsible for Milwaukee’s unusually strong socialist movement. The subset of German Americans who were critical of capitalism studied European ideas, replicated European organizational structures, and capitalized on ethnic solidarity. During the 1890s, Victor Berger, a German Jewish immigrant from Austria-Hungary, built the Social Democratic Party of Milwaukee on German-American foundations, and German wards regularly gave socialists their clearest victories. But German Milwaukeeans could always be found among the socialists’ opponents in the two main parties. Examples include Peter Deuster, editor of the Seebote, who served in Congress from 1879 to 1885, and Emil Wallber, a leading Turner and Republican, who served as Milwaukee’s mayor from 1884 to 1888. The first socialist mayor, Emil Seidel, was the bilingual son of German-born parents, but so too was the man who beat him on the “fusion” ticket in 1912. The mayoral succession of 1912 showed that German Milwaukee was diverse and confident but changing on the eve of World War I. New immigration had begun to fall off after 1900. Immigrants continued to raise their children to speak German, but descendants of the earlier immigrants were beginning to favor English. “Old” St. Mary’s Catholic Church, the German-English Academy, and a few other organizations adopted English before World War I. The number of different ethnic associations was declining, and Milwaukee was down to one German-language daily newspaper by 1913, although weeklies abounded. German Americans still argued that being a good German only made one a better American, but World War I tested that notion. Before the United States entered the war, many German Americans supported Germany in its fight against Great Britain. 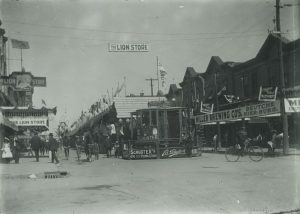 In 1916, members of prominent families such as the Bergers and the Pabsts joined about 175,000 other men, women, and children who attended a bazaar to raise money for Germans in their time of need. The overwhelming majority of German Americans immediately renounced any support for Germany as soon as Congress voted to declare war in 1917, but some immigrants persisted in criticizing the decision. The Germania-Herold ran an editorial calling on German Americans to “accept new duties under new conditions” and enlist, while Congressman Victor Berger continued to speak out against American involvement. Because the Espionage Act of 1917 made such dissent illegal, Berger was indicted and convicted. Significantly, Milwaukeeans reelected him to Congress before the Supreme Court overturned the ruling. With official encouragement and support, private groups attacked German language and culture. Armed “patriots” prevented a performance of William Tell at the Pabst Theater in April 1918, prompting the management to discontinue German-language performances until the war ended later that year. The Milwaukee Journal led a successful drive to eliminate German-language instruction from public elementary schools, and enrollment in high school classes dropped from 30,000 in 1916 to 200 in 1919. Some businesses, organizations, and even individuals changed their names. The Deutscher Club, for example, became the Wisconsin Club. Persecution hastened the natural waning of ethnic organizing. Many German-language newspapers lasted for decades, but circulation decreased during the 1920s. West Bend lost its newspaper in 1917, and Port Washington’s ceased publication in 1928. The Pabst Theater showed fewer German-language productions, and ended them completely in 1931. Secular societies saw falling membership, and more of them began to conduct business in English. Prohibition discouraged people who appreciated German-style sociability from joining organizations such as the Turners and disrupted immigrant routines. Rural Catholic and Lutheran parishes remained distinctively German for longest, with some still requesting German-speaking clergymen in the 1930s. German Americans had scant interest in supporting Germany as Adolph Hitler rose to power. A handful of more recent immigrants started a small branch of the pro-Nazi Volksbund in Milwaukee during the 1930s, but more German Americans picketed its sparsely attended rallies. The Volksbund’s greatest local feat was the construction of a short-lived summer camp in Grafton in 1937. World War II held little of the controversy of World War I. The exodus of white Americans from the post-war city to the suburbs was a less dramatic development for German Americans than it was for members of other ethnic groups. They had been in the United States longer, and the areas becoming suburbs were already home to the descendants of German immigrants. During the second half of the twentieth century, German culture came to be viewed as quaint and nonthreatening, perhaps because it was more difficult than ever to distinguish the descendants of German immigrants from other white Milwaukeeans. In 1990, 48 percent of city residents still claimed some German heritage, but few of them spoke German or belonged to organizations maintaining German traditions. Aspects of German festive culture reemerged in commercialized form. The Old World Third Street entertainment district, restaurants, and brewery tours nod to Milwaukee’s German past. German Fest is one of the ethnic celebrations held annually on Milwaukee’s lakefront. Its combination of good cheer and cultural pride harks back to the nineteenth century, but nostalgia has replaced German-language debates and interactions. New immigrant groups are keeping ethnic pluralism alive in their own ways. Sources: Kathleen Neils Conzen, “Germans,” in The Harvard Encyclopedia of American Ethnic Groups, ed. Stephan Thernstrom, Ann Orlov, and Oscar Handlin (Cambridge, MA: Belknap Press of Harvard University Press, 1980), 413; Census of Population and Housing, 1960, p. 51-309; Census of Population and Housing, 1970, p. 51-518. ^ Kathleen Neils Conzen, “Germans,” in The Harvard Encyclopedia of American Ethnic Groups, ed. Stephan Thernstrom, Ann Orlov, and Oscar Handlin (Cambridge, MA: Belknap Press of Harvard University Press, 1980), 413. ^ Katja Wüstenbecker, Deutsch-Amerikaner im Ersten Weltkrieg: US-Politik und nationale Identitäten im Mittleren Westen (Stuttgart: Franz Steiner Verlag, 2007), 324. ^ Bruce Levine, The Spirit of 1848: German Immigrants, Labor Conflict, and the Coming of the Civil War (Urbana, IL: University of Illinois Press, 1992), 19-41; James J. Sheehan, German History, 1770-1866 (Oxford: Clarendon, 1989), 451-524. ^ Alison Clark Efford, German Immigrants, Race, and Citizenship in the Civil War Era (New York, NY: Cambridge University Press, 2013), 17-32. ^ Conzen, “German Catholics in America,” in The Encyclopedia of American Catholic History, ed. Michael Glazier and Thomas T. Shelley (Collegeville, MN: The Liturgical Press, 1997), 573-74; Hasia Diner, The Jews of the United States, 1654-2000 (Berkeley, CA: University of California Press, 2004), 86-87; Conzen, Immigrant Milwaukee, 1836-1860 (Cambridge, MA: Harvard University Press, 1976), 18-19. ^ Quoted in Conzen, Immigrant Milwaukee, 18. ^ Harry H. Anderson, ed., German-American Pioneers in Wisconsin and Michigan: The Frank-Kerler Letters, 1849-1864 (Milwaukee: Milwaukee County Historical Society, 1971), 76, 77. ^ Conzen, Immigrant Milwaukee, 14. ^ Conzen, Immigrant Milwaukee, 127-35. ^ U.S. Bureau of the Census, The Statistics of the Population of the United States, vol. 1 (Washington, D.C.: Government Printing Office, 1872), 377, 389. ^ Jon Gjerde, Minds of the West: Ethnocultural Evolution in the Rural Middle West, 1830-1917 (Chapel Hill, NC: University of North Carolina Press, 1997), 135-221. ^ Conzen, Immigrant Milwaukee, 56-59, 93-94. ^ Conzen, Immigrant Milwaukee, 66. ^ Conzen, Immigrant Milwaukee, 11-13, 89-90. ^ Conzen, Immigrant Milwaukee, 104-6. ^ Steven M. Avella, In the Richness of the Earth: A History of the Archdiocese of Milwaukee, 1843-1958 (Milwaukee: Marquette University Press, 2002), 68. ^ These counties were home to communities that fit the characterizations in Conzen, “Immigrant Religion and the Republic: German Catholics in Nineteenth-Century America,” German Historical Institute Bulletin 35 (2004): 43-56. ^ Conzen, “German Catholics in America,” 573, 575. ^ John A. Braun, Together in Christ: A History of the Wisconsin Evangelical Lutheran Synod (Milwaukee: Northwestern Publishing House, 2000), 4. ^ Wilhelm Hense-Jensen and Ernest Bruncken, Wisconsin’s Deutsch-Amerikaner bis zum Schluß des neunzehnten Jahrhunderts, vol. 2. (Milwaukee: Verlag der Deutschen Gesellschaft, 1902), 174-81. ^ John Gurda, One People, Many Paths: A History of Jewish Milwaukee (Milwaukee: Jewish Museum Milwaukee, 2009), 12-17. ^ Conzen, Immigrant Milwaukee, 167. ^ Conzen, Immigrant Milwaukee, 175, 182. ^ Conzen, “Ethnicity as Festive Culture: Nineteenth-Century German America on Parade,” in The Invention of Ethnicity, ed. Werner Sollors (New York, NY: Oxford University Press, 1989), 44-76. ^ George Bruce, “Memoirs of George Bruce,” Wisconsin Magazine of History 16 (1933): 364. ^ Efford, German Immigrants, Race, and Citizenship, 42. ^ Conzen, Immigrant Milwaukee, 194-223. ^ Efford, German Immigrants, Race, and Citizenship, 46-47. ^ Carl Heinz Knoche, “The German Immigrant Press in Milwaukee” (Ph.D. diss., The Ohio State University, 1969), 21-26. ^ Knoche, “The German Immigrant Press in Milwaukee,” 49-50. ^ J. J. Schlicher, “Bernhard Domschcke: I. A Life of Hardship,” Wisconsin Magazine of History 29 (1946): 319; Hans L. Trefousse, Carl Schurz: A Biography, 2d ed. (New York, NY: Fordham University Press, 1998), 71-73. ^ Wilhelm Hense-Jensen, Wisconsin’s Deutsch-Amerikaner bis zum Schluß des neunzehnten Jahrhunderts, vol. 1 (Milwaukee: Verlag der Deutschen Gesellschaft, 1900), 193. ^ Conzen, Immigrant Milwaukee, 199; Walter D. Kamphoefner, “German-Americans and Civil War Politics: A Reconsideration of the Ethnocultural Thesis,” Civil War History 37 (1991): 232-45. ^ Efford, German Immigrants, Race, and Citizenship, 53-85. ^ Efford, German Immigrants, Race, and Citizenship, 89; Schlicher, “Bernhard Domschcke: II. The Editor and the Man,” Wisconsin Magazine of History 29 (1945): 451-52. ^ Frank L. Klement, “Deuster as a Democratic Dissenter during the Civil War: A Case Study of a Copperhead.” Transactions of the Wisconsin Academy of Sciences, Arts and Letters 55 (1966), 21-38; Lawrence H. Larsen, “Draft Riot in Wisconsin, 1862,” Civil War History 7 (1961): 421-27. ^ Efford, “The Appeal of Racial Neutrality in the Civil War-Era North: German Americans and the Democratic New Departure,” Journal of the Civil War Era 5 (2015): 76-77. ^ Wisconsin Banner und Volksfreund, January 3, 1861, September 26, 1862. ^ Hense-Jensen, Wisconsin’s Deutsch-Amerikaner, vol. 1, 184; Christian Keller, Chancellorsville and the Germans: Nativism, Ethnicity, and Civil War Memory (New York, NY: Fordham University Press, 2007). ^ Milwaukee Daily Sentinel, May 30, 1871; Heike Bungert, “Der Deutsch-Französische Krieg im Spiegel der Wohltätigkeitsbazare und Feiern deutscher und französischer Migranten in den USA, 1870/71,” in Deutschland—Frankreich—Nordamerika: Transfers, Imaginationen, Beziehungen, ed. Chantal Metzger and Hartmut Kaelble (Stuttgart: Franz Steiner Verlag, 2006), 156. ^ William F. Whyte, “The Bennett Law Campaign in Wisconsin,” The Wisconsin Magazine of History 10 (1927): 363-90. ^ Karl J. R. Arndt and May E. Olson, German-American Newspapers and Periodicals, 1732-1955: History and Bibliography (Heidelberg: Quelle & Meyer, 1961), 668-98, 701 710; Knoche, “German Immigrant Press,” 144. ^ Heidi Marzen, “The George Brumder Publishing Company: A German-American Legacy,” Max Kade Institute Friends Newsletter, 10, no. 1 (Spring 2001). ^ Milwaukee Daily Journal, July 22, 1886; Peter C. Merrill, German-American Urban Culture: Writers and Theaters in Early Milwaukee (Madison, WI: Max Kade Institute for German-American Studies, 2000), 24-38, 78-95, 87. ^ Landscape Research, Built in Milwaukee: An Architectural View of the City (Milwaukee: City of Milwaukee, 1981), 141. ^ Anke Ortlepp, “Deutsch-Athen Revisited: Writing the History of Germans in Milwaukee,” in Perspectives on Milwaukee’s Past, ed. Margo Anderson and Victor Green (Urbana: University of Illinois Press, 2009), 115. ^ Anke Ortlepp, Auf denn, ihr Schwestern! Deutschamerikanische Frauenvereine in Milwaukee, Wisconsin, 1844-1914 (Stuttgart: F. Steiner, 2004), 153-162, 188-89. ^ Robert Lewis Mikkelsen, “Immigrants in Politics: Poles, Germans, and the Social Democratic Party of Milwaukee,” in Labor Migration in the Atlantic Economies: The European and North American Working Classes during the Period of Industrialization, ed. Dirk Hoerder (Westport, CT: Greenwood Press, 1985), 282-84; Frederick C. Luebke, Bonds of Loyalty: German-Americans and World War I (DeKalb, IL: Northern Illinois University Press, 1974), 191, 300. ^ Gerd Korman, Industrialization, Immigrants, and Americanizers: The View from Milwaukee, 1866-1921 (Madison, WI: The State Historical Society of Wisconsin, 1967), 27-71; Marvin Wachman, History of the Social-Democratic Party of Milwaukee, 1897-1910 (Urbana, IL: University of Illinois Press, 1945), 10. ^ Bayrd Still, Milwaukee: The History of a City (Madison, WI: The State Historical Society of Wisconsin, 1948), 283. ^ Joseph Salmons, “The Shift from German to English, World War I and the German-Language Press in Wisconsin,” in Menschen zwischen zwei Welten, ed. Walter G. Rödel and Helmut Schmahl (Trier: Wissenschaftlicher Verlag Trier, 2002), 187. Miranda E. Wilkerson and Joseph Salmons, “‘Good Old Immigrants of Yesteryear’ Who Didn’t Learn English: Germans in Wisconsin,” American Speech 83, no. 3 (2008): 259-83; Joseph Salmons, “Community, Region and Language Shift in German-speaking Wisconsin,” in Regionalism in the Age of Globalism, vol. 1, Concepts of Regionalism, ed. Lothar Hönnighausen, Marc Frey, James Peacock, and Niklaus Steiner (Madison, WI: Center for the Study of Upper Midwestern Cultures, University of Wisconsin Madison, 2005), 129-38. ^ Ortlepp, “Deutsch-Athen Revisited,” 114-15; Avella, In the Richness of the Earth, 430. ^ Ortlepp, “Deutsch-Athen Revisited,” 115; Arndt and Olson, German-American Newspapers and Periodicals, 682, 684. ^ Germania-Herold Abendblatt, April 5, 1917, 1, 8; Luebke, Bonds of Loyalty, 230. ^ Sally M. Miller, Victor Berger and the Promise of Constructive Socialism, 1910-1920 (Westport, CT, Greenwood Press, 1973), 198-201. ^ Luebke, Bonds of Loyalty, 294-296. ^ Wüstenbecker, Deutsch-Amerikaner im Ersten Weltkrieg, 292. ^ Wüstenbecker, Deutsch-Amerikaner im Ersten Weltkrieg, 258; Luebke, Bonds of Loyalty, 296. ^ Arndt and Olson, German-American Newspapers and Periodicals, 684, 701, 710. ^ Merrill, German-American Urban Culture, 99. ^ Milwaukee Turner, no. 4 (May 1941): 2. ^ Milwaukee-Herold Sonntagspost, August 29, 1920; Stephen Gurgel, “The War to End All Germans: Wisconsin Synod Lutherans and the First World War” (M.A. thesis, University of Wisconsin-Milwaukee, 2012), 196; Avella, In the Richness of the Earth, 430. ^ Milwaukee Journal, July 14, 1940, 14. ^ John Gurda, The Making of Milwaukee (Milwaukee: Milwaukee County Historical Society, 1999), 59. ^ Victor Greene, “Dealing with Diversity: Milwaukee’s Multiethnic Festivals and Urban Identity,” Journal of Urban History 32 (2005): 820-49. Efford, Alison Clark. German Immigrants, Race, and Citizenship in the Civil War Era. New York, NY: Cambridge University Press, 2013. Korman, Gerd. Industrialization, Immigrants, and Americanizers: The View from Milwaukee, 1866-1921. Madison, WI: The State Historical Society of Wisconsin, 1967. Luebke, Frederick C. Bonds of Loyalty: German-Americans and World War I. DeKalb, IL: Northern Illinois University Press, 1974. Ortlepp, Anke. “Deutsch-Athen Revisited: Writing the History of Germans in Milwaukee.” In Perspectives on Milwaukee’s Past, edited by Margo Anderson and Victor Green. Urbana: University of Illinois Press, 2009.